The free Moleskine, a Creative Cloud connected app gives you the ability to instantly turn hand-drawn sketches into fully workable digital files within the Creative Cloud. Draw on any custom page of the Moleskine Smart Notebook then take a picture of your drawing using the Moleskine App. The special page markings in the notebook allow the app to process and optimize the image as a JPG file before converting it to an SVG file. With an Adobe Creative Cloud membership, easily sync your artwork to the Creative Cloud and open them for refinement in Adobe Illustrator CC or Adobe Photoshop CC. With the Moleskine Smart Notebook and Moleskine App, Creative Cloud connected products by Moleskine, it’s easy to take your initial ideas to finished design. Your creative journey starts here 1. Draw. Draw on any page in the notebook using any tool of your choice, although black ink and markers tend to work best. 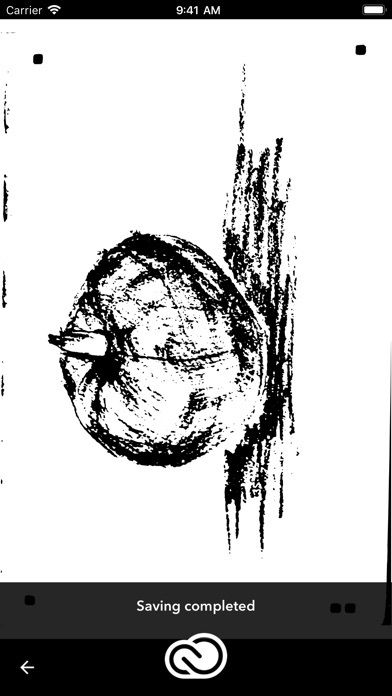 Sketch your idea using broad strokes as opposed to shading. 2. Capture. Use the free Moleskine, a Creative Cloud connected app to take a picture of your drawing. If you are satisfied with the image, after choosing the setting, tap on use image button. 3. Select preprocessing actions. The preprocessing actions are specifically developed to detect the orientation of the page, correct perspective and alignment distortions. The app uses the special page markings to help process and optimize the image. The image correction actions should be used to correct the images according to the lighting condition during the capturing or the technique or tool used for drawing. If you are not satisfied with the result use other preprocessing actions or recapture image. 4. Sync. Sync with Creative Cloud to store both files formats (JPG and SVG) in your Creative Cloud Assets folder. 5. Refine. After you’ve synced your files, you can open and edit them in Adobe Illustrator and Adobe Photoshop — or refine and utilize the JPG files in other Creative Cloud desktop and mobile applications. 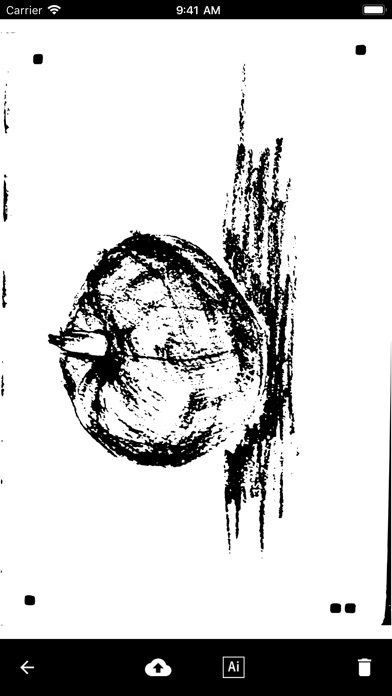 Image preprocessing steps Crop by markers and detect orientation Detects markers in page corners. Distinguishes between one-page and two-page layouts and selects appropriate boundary marker. Crops picture by four obtained markers. The user is able to adjust markers position if necessary. Perspective correction and alignment Corrects perspective distortion (from trapezoidal shape to rectangular) and corrects any tilt of the notebook within the picture. Level out Corrects pages curvature in case notebook hasn’t been fully opened or paper sheets have curved. Auto contrast Automatic tuning of picture contrast to make the drawing stand out from the page more. Noise removal and adjustment of brightness and contrast Processes blurry, out-of-focus and dark pictures through noise removal and adjustment of brightness and contrast. Create without boundaries, wherever you are (tips for making it picture perfect) Preparing the notebook Lay the notebook flat and straighten the pages, making sure the notebook is completely open. Moleskine notebooks are specially designed to lay flat at 180°. Lighting the page Lighting greatly affects the quality of the resulting image. Best results can be achieved with bright and evenly distributed light, preferably daylight. If you’re using artificial lighting, use two carefully positioned sources to avoid shadows or glare. Turning off the camera flash can also prevent sharp highlights and shadows on the page. If you have to use the flash, take photos from a distance of approximately 50 cm (20 in). Capturing the image It’s best to capture only one page at a time. Hold your iPhone parallel so that the page edge is aligned with the edge of the viewfinder. The entire page (including page markers) should be visible within the viewfinder. Before taking the photo, ensure your work is in focus by tapping the screen. 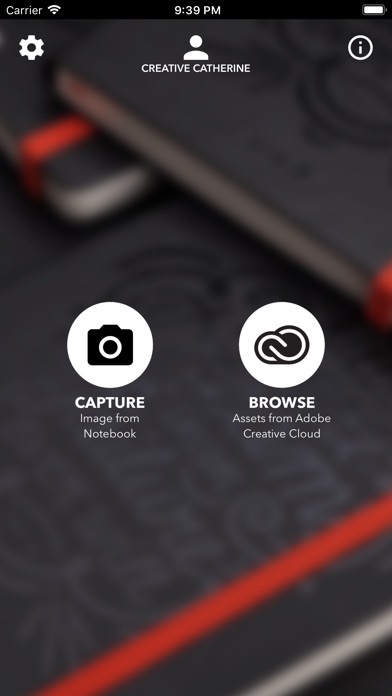 Adobe and Moleskine should be shot for putting out this lousy product. Just substandard. You can ditch the Moleskine book, too. Just as useless. Use Livescribe instead; at least the latest iteration will let you work with vectors. The resulting image in Creative Cloud is a mess, and a mass, of path points. Forget using any image you create. Unusable. You spend more time cleaning up the utter mess than you would starting from scratch. Words cannot describe the (1) disappointment that anyone at Adobe would think this was ready for primetime (but then the Adobe people have become arrogant f**ks disdaining of their customers, they don’t like the hoi polloi), and (2) the amazement that anyone at Moleskine would think this is a saleable product. I'm amazed that Moleskine® and Adobe™ have given their approval for this app, which is apparently only designed for an iPhone (not iPad— and in which case they should be specifying that). There's no excuse for any new app *not* to be responsive (i.e. designed for any screen size or orientation). iPads are now hi-resolution ("retina") and apps should by now take that into consideration. With my iPad Pro (which I typically have in landscape/horizontal orientation paired with a keyboard), even at the "2X" size, the app only takes up about 60% of the screen and stays in portrait/vertical orientation. Take this off the market, and give it proper UX/UI design attention, please; this is awful. Even though it's free, it reflects very poorly on both brands (Moleskine® and Adobe™). I love moleskins and I was really excited for this book and app combo. Overall I'm very disappointed. There is nothing special about the book except for the registration marks. It's difficult to capture your image and you constantly have to retake the photo to make sure it pulls in your entire image. The conversion to a SVG is a great concept but doesn't work well. There is no editing function in the app, nor can you pull in pre edited photos from your camera roll so it's hard to get enough contrast to even make the conversion work properly. The website shows images drawn in pencil but the fine print for the app basically tells you to use pen or marker in order for it to work. Guess I will stick with scanning my images in. This notebook and app combination is no different than sketching in ANY sketchbook and taking a photo with your camera. The perspective tool in this app falls short- 50% accurate The camera window itself is only ¾ of the screen and the SVG conversion is no better than live trace in illustrator. I truly expected more when purchasing this notebook and using it with the app. Sorely disappointed. This was an exciting idea, but horrible execution. The app never converts the picture correctly and is a nightmare when I want to capture notes. This really seems more like a gimmick than something that actually functions. No surprise adobe failed at this one. Maybe moleskin was using the opportunity to prove the pen and paper are mightier than...the app? I am having the same issues as the above comment. I was very excited for this without quite knowing what it does. Essentially the the notebook itself is not required. The only thing it does, using the printed registration squares, is slightly fix perspective if a photo is taken at an angle ( but don't expect too much from this feature). 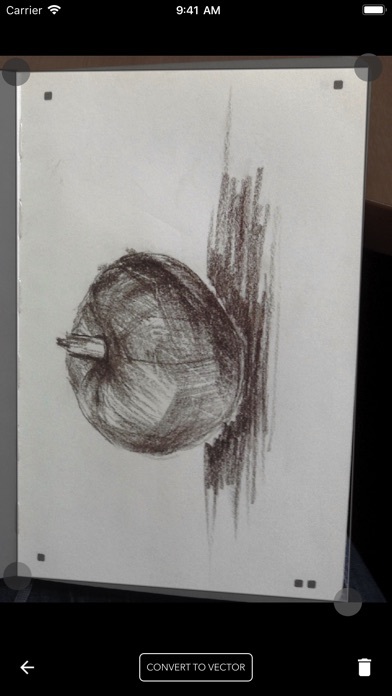 You can snap a picture of a sketch on any paper and it will work just the same. The app is poorly made, and the only two icons are low resolution. The camera viewfinder does not even fill the screen. The quality that is expected of both Adobe and Moleskine are not present in this app. Please get it together and try again. Every time I try to take a picture of a page the app crashes. I'm using an iPhone 6 Plus, and the camera view isn't expanding out to fill the entire screen, which I suspect is creating the issue. Unfortunately, my notebook and app are essentially unusable until this bug is fixed. Will edit my review accordingly once these changes are made. I have the original Moleskine app that works great on the iPad. 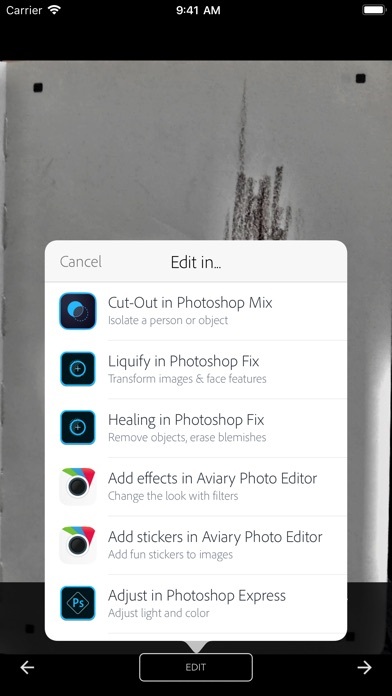 This new Creative Cloud app isn’t iPad aware, meaning it doesn’t take advantage of the larger screen.